Enemy of Thought's self-titled EP contains six tracks of rock'n'roll that boast a late 70s / early 80s type of feel but with a modern attitude and edge added on top. It's a little like Alice in Chains with Ozzy Osbourne on vocals although, of course, it's more than that. The band, and this EP, definitely have their own unique sound. Most are the tracks herein are mid-paced, guitar-driven rockers although at least one track, "You Don't Hear," picks up the pace a little, not to mention ratchets up the guitar work with Zakk Wylde-like squelches and gritty solos. Even at only six tracks, however, this EP starts to wear out its welcome. It's one of those CDs that definitely has a sound it can call its own but, unfortunately, sometimes one track tends to blend into another. Hopefully, with a full-length, the band can interject a few tracks that are strikingly different. Still, "Enemy of Thought" is definitely worth a listen. 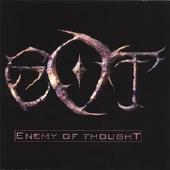 Enemy of Thought: Chris Adams - vocals; Ian Mason Jones - bass; Norman Walker - drums; Pete Frank - Guitar. For more information, check out http://www.myspace.com/enemyofthought or http://www.eot.org.uk.